↑ "Apollo 17 PAO Mission Commentary Transcript" (PDF). NASA. 2001. पृ॰ 106. अभिगमन तिथि May 11, 2017. SC: You're loud and clear, Bob, and could you give us our distance from the Earth? ... CAPCOM: 18 100, Fido says. 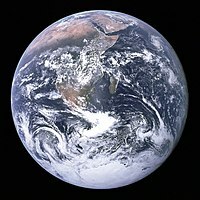 ↑ "Visible Earth:The Blue Marble from Apollo 17". Nasa.gov. NASA. अभिगमन तिथि 10 December 2017. ↑ "Apollo 17 30th Anniversary: Antarctica Zoom-out". Scientific Visualization Studio. NASA. November 21, 2002. अभिगमन तिथि May 11, 2017. ↑ Petsko, Gregory A (2011). "The blue marble". Genome Biology. 12 (4): 112. डीओआइ:10.1186/gb-2011-12-4-112. ↑ "Apollo Imagery". NASA. November 1, 2012. अभिगमन तिथि January 6, 2018.